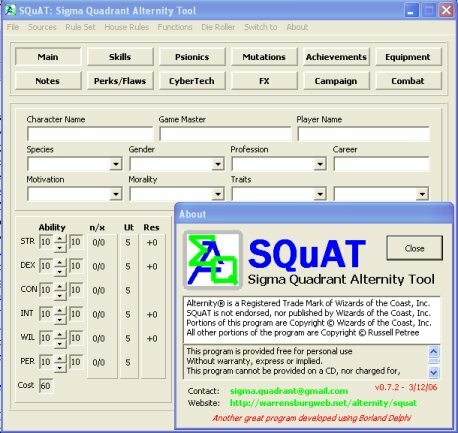 SQuAT is my tool for creating and managing characters for the game Alternity. WALTER already does that. Why another? WALTER is an cool program. Problem is that you can't add new races and the developer is too busy to make changes and won't accept help to fix and enhance the program. There are specific features I wanted that weren't there, like new races, variant rules support, etc..
Can I convert from WALTER (import character files)? Yes! And SQuAT will attempt to tell you what it did not successfully convert. It does not currently support any acheivement based updates. Can I move back to WALTER if I don't like your program? 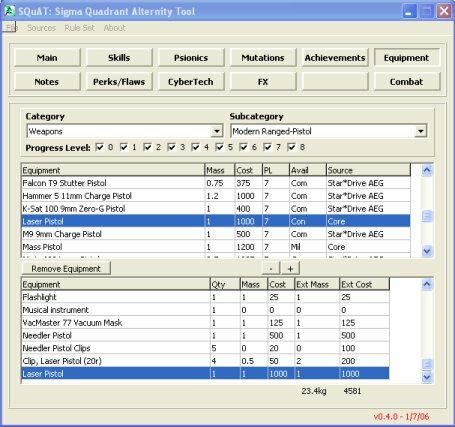 WALTER will not load character files created by SQuAT. To convert back, simply use your backed up copy of your character file. WALTER supports [feature here] and SQuAT doesn't!! SQuAT is a working in progress. I am working on the features that are most important to me. I wanted to give back to the Alternity community though with what I do have. If it doesn't work for you.. Don't use it. How do I add new races/equipment/etc? Back up the originals and edit the XML files. SQuAT doesn't load properly after I edited the XML? I don't want to edit XML. I want an nice GUI interface. This program is a hobby for me. I will add features as I am able and will entertain enhancement requests. Those enhancements will be prioritized based upon my time and motivation. SQuAT wiped out my character file(or ate my computer or blew up my house or whatever your claim is)!! SQuAT is provided as is without warranty, express or implied. It is provided free of cost and you cannot be charged for it. Should you use this tool and something bad coincidentally occur and you decide to sue, you hereby agree to a change of venue to the Courts of the Galactic Council in the Comforting Light System in the Sigma Quadrant. You must appear in person to present your claim. What is a Source and how is it used? A source provides data like races, professions, attributes, professions, psionics, perks, flaws, equipment, etc. You can make a source active by default in that file. A source is defined in "config.xml" file and then is represented as the value of the "source" attribute of an element. Ok, what about a "Rule Set"? A "Rule Set" defines changes to the Core rules. 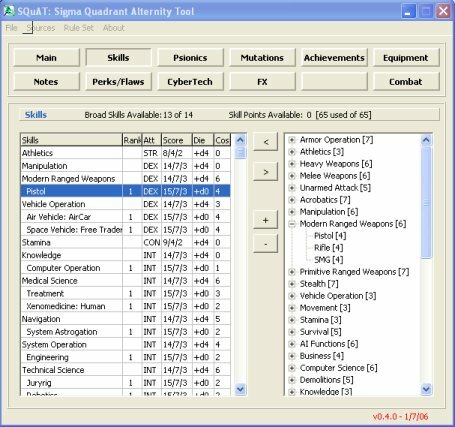 The amount of starting attribute points, formula for determining skill points, providing bonus skill points, etc. Your equipment list is VERY lacking/I have a new race for you to add/etc. Can I send it to you to get added? Sure, I will review and try to add to the xml files - assuming they come from an official supplement or I like them.. I don't like your variant races! I use the same names but different details. How can I use mine? Change the XML file. Make sure that players in your games use your updated xml files. Enjoy!